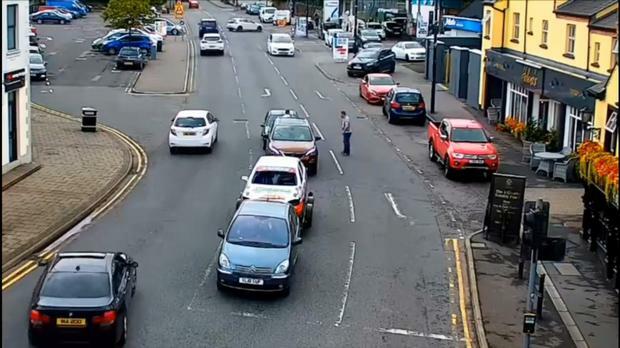 Police have released CCTV footage of a drunk driver hitting two pedestrians in a Northern Ireland town in the middle of the day. The sentencing, however, sparked anger with members of the public saying it was "too lenient". The incident happened on August 12, last year at around 11.30am. Police posted a video showing the car driving through Maghera and approaching a queue of traffic at a set of lights. As it approaches two pedestrians walk across the road and just behind the last car in the queue before the drunk driver arrives. However, instead of stopping, the car continues on hitting both men and trapping one against the car in front. The driver - who police did not name - was more than three times the drink-drive limit. After a court appearance he was sentenced to a 16-month driving ban, reduced to 12 on completion of a course and given a £250 fine. "Amazingly we did not end up dealing with a fatality," police said urging people to never drink and drive. Police pointed out none of the two pedestrians were under the influence of alcohol. Many of those reacting to the post on Facebook hit out at the sentence handed down to the driver. However, police pointed out that it was not their responsibility the punishment handed down by the judiciary.